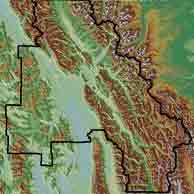 Flathead County's Geographic Information Systems (GIS) Department originated in 1993, and currently operates under the Information Technology (I.T.) Department. GIS is housed on the second floor of the old courthouse and employs a staff of four dedicated individuals that provide mapping support for all of the county offices, other organizations at all levels of the government, private organizations and the public. Data "layers" maintained in the GIS library include land ownership, zoning use, transportation, addresses, election information, district boundaries, hydrology, environmental, geologic, demographic information, and aerial imagery. The GIS department handles new address assignment and road naming for unincorporated Flathead County. In addition to supporting the mapping needs of county offices such as of the E911 dispatch center, the Plat Room and Planning & Zoning offices; the GIS Department also provides mapping services to many other government and private agencies, as well as the general public. The mapping data the department maintains facilitates informed decision-making, long-range planning, development review and permitting functions within the county.